Scavengers are the offal eaters of the earth - the carrion crows. They eat whatever bits of meat and rotted flesh they can find, no matter what beast it comes from, man or animal. When they see smaller animals eating the wastes of the dead, they will stay hidden, and raise a screeching sound that makes hair stand on end to frighten away the others. They typically move to stay downwind of any other creatures, because they are surrounded by a nauseating smell of death. If the Scavengers are unable to find food of their own, they will creep closer to areas inhabited by humans, and steal away small children. They are able to mimic human voices, and will stalk their prey to learn the voices of their parents. When the children wander near, following the calls of the Scavengers, the monsters will exhale a breath of vile gas that results in instant death and rapid decomposition. 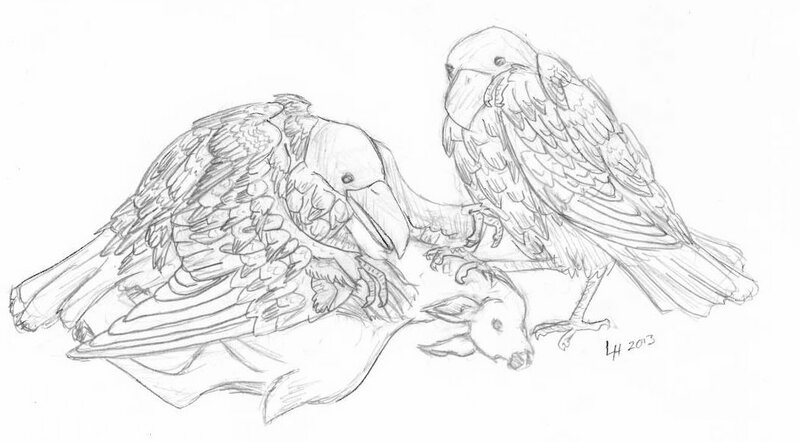 Scavengers and the remains of a doe; by Laura Hamilton (finaira). These bird-like creatures are taller than the average human, and hulking in shape. Their bodies are made up of hundreds of wings, all folded close to their fatted form. They cannot fly - they only skitter on the ground on two feet, like rodents. Their bones are brittle, but protected by their thick skin and layers of fat. They have massive black beaks that they tuck close to their stomachs, and they can swallow creatures up to the size of a large dog. The only evidence they typically leave is feathers like a crow, and rolled up masses of bone, grit, and cartilage that they regurgitate.